The Joshua Tree Double Century Rider Registration opens December 24th, 2018. Light breeze after sunrise riding west, No heavy winds usually this time of yr. 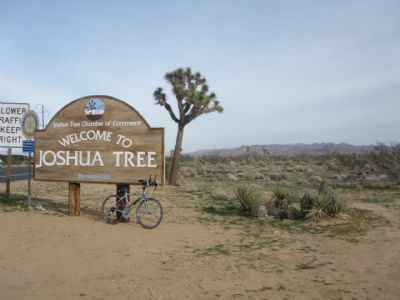 WELCOME TO JOSHUA TREE DOUBLE CENTURY 2019! Starting in Twentynine Palms, CA, just east of Joshua Tree City, this Double Century will be going through Joshua Tree National Park, as our PERMIT allows! There is no need to pay the 10. entry for individual cyclists as we've done in the past; just ride on through! This Double Century has about is 195 miles, with about 9,100 feet of elevation gain and shows of the most spectacular, mesmorizing desert in the U.S.A. in your Ride Director's opinion. There are no turns the first 15 miles, to Park Blvd, which takes you straight into the Park. After this left turn at the signal light, there are no more signals, until about 1/2 mile before the Finish, which is usually green. Also, re: stop signs, there are four total in 200 miles. The pavement around the entire DC is smooth, with no expansion cracks, chip seal, or potholes! The one small requirement from the National Park for Riders is a reflective vest, an ANSI class 1 vest, which is the lowest quality. If you are wearing a higher quality vest, such as a class 2, that's fine. These are about 6.50 from Walmart, Home Depot, or Harbor Freight. Hydration is extremely important in the dry desert air! Ideally you should have two full waterbottles and a small 40 oz. Camelbak at least half full, or three full waterbottles for this desert adventure. Please fill your water bottles with our good water designed for optimal hydration and alkalinity, available at Rider Check-in the night before and morning of Ride Start, when you sign the waiver. Highly recommend you start out with liquid electroylytes in your water that we provide, or use your own. Since the desert air is very dry, therefore it's recommended you start drinking lots of water the day before, along with electrolytes, and ionic minerals. Electroyltes are five of the 72 minerals your body needs everyday of your life for optimal health and longevity in this sport. Ionic minerals are all the minerals in plant form, which is what your body is 100% capable of digesting and absorbing, which are not made from rocks which come in tablet and capsule form. In the liquid, ionic-plant based form you need about a teaspoon a day, but more because you sweat them out along with your water. These help prevent symptoms of dehydration, which includes cramping, nausea, hot foot, slowing down, brain fade, inner complaining, irritability, and denial that you are, in fact, dehydrated. Under-estimating your need for water in the desert is the number one mistake you want to avoid, and seems to be the number one reason why riders come to alas, DNF. This is why ionic liquid minerals are served at every Rest Stop, on every ride Mountain High puts on. The first 14.5 miles are leading you to Joshua Tree National Park Blvd.,left turn, then there are five gentle miles, up to the entrance of JT National Park itself, which is about 62 miles mostly traveling south with two in and out loops in the Park. After exiting the JTNP, the same road leads to the 10 fwy./ a T, of course. The roads will not be marked. The first turn in the JTNP is after 15 miles, up to Keys View. This road begins a long, very gradual five mile climb to the deadend, where your First Rest Stop will be, at mile 30, with a View that you'll want to have your camera for! It does get steep near the very end for about a mile or so, but heck, that's the steepest climb in the entire Double! So you come back down on an awesome descent with more spectacular views, to the main road and turn right at the T. Traveling along here is flat and winds back and forth, eventually curving to the ri and descending to your next turn, again marked by a sign to Cottonwood, which you do not want to miss or you'll end up back at the Ride Start. On this road, it's a gentle 1-2% climb for two miles then a long descent and flat across the desert floor all the way over to the other side of this desert where you will then begin your last climb in the Park, a rather long five miles or so of climbing, being glad when you finally see a long flat road ahead of you to the Cottonwood Ranger station on your left and restrooms and water fountain. I would prefer you drink the water we give you, as it just tastes better. Right after the Cottonwood Ranger blgd. is your one mile climb to a dead end, which helps get you the needed two miles to make this a double century, so please, don't miss it; you will need to pick up a helmet sticker. The last half mile out of the Park is nothing really, and then an 8 mile whopping descent to the freeway, where you will get on the wide shoulder, headed east for five miles to Lunch. (There are two Rest Stops in the National Park: mile 30 and 66.) The Park exit is not a Rest Stop, but does have restrooms and water, plus we serve water & food bars just after the Ranger Station where you have to get a helmet sticker a the dead of of the 1 mile loop. Chiraco Summit, spells LUNCH. Please look at the pictures on the website, at the bottom of the home page, so you will know ahead of time where to look for Lunch. There are restrooms here. Chiriaco Summit, is an exit off the I-10 freeway, the only civilization out here. Volunteers will be making delicious sandwiches for each rider and volunteer, plus there will be potatoe salad, chips, Hammer products, electrolytes, and fresh fruit. This RS is over to your left, through a gravel parking lot, infront of the museum, and NOT straight ahead where the gas station and store are. Hopping back on the bike after lunch you will spend a few more miles on the wide shoulder freeway to reach the Eagle Mountain Road exit, leading you to the historic ghost town of Desert Center which is your Strawberry-banana smoothie stop! Custom-made porta-potties designed by your Ride Dir., and made by Kermit Ganier, RD for the Grand Tour, just for this event. Leaving Desert Center ghost town Rest Stop, expect desert temperatures to rise up into the mid 90's, after you turn north onto Rice Road which has no turns, signs, stop lights and very little traffic, for the next 25 miles. Rice Road is a road that stair-steps up with hidden pockets of short dips, making the ride along here more interesting. There is usually no traffic, great smooth pavement, and vast open desert vistas with mountain ranges on both sides. Leave this R.S. with a group of riders, as you'll want to stay together and take trades up front, fending off the frequent headwinds. This is when you'll be glad you brought music. The next Rest Stop is only 15 miles, which almost every rider appreciates. Remember to look at all the pictures showing what you can expect on this Double. I highly recommend music and riding in a paceline to help you get through this seemingly long 25 mile stretch Generally the wild desert flowers flourish in this area, in tiny purple and pink flowers, down by your feet, just to the right of your smooth paved road! After the water, ice, & mental pick-up stop, on Rice Rd., the road will begin to curve slightly to the right where you'll alas see the high radio tower in the distance at the summit marking your next rest stop (Again, it will help you to look at the pictures of your route on web or Joshua Tree Facebook page.) That summit on Rice Road is your last turn of J.T. , 50 miles from the finish. The Oasis Rest Stop is up here. The pavement is smooth and new. This is where I personally would recommend you send your drop bags (Rest Stop 6) and put your lights on here, as the sun will go down fast for a lot of you, before the next rest stop, in 15 miles. Take your warm gear with you from your drop bag, here too. If you’re fast, send your drop bag to RS 7, 8 or the Finish. From the Oasis Rest Stop (RS 6) you will head west with no turns, signals, stops signs or traffic. Along here is where Twentynine Palms Hwy introduces you to another type of open, vast, desert scenery. The long-slopping hills zigzag westward (and homeward) with mountain ranges in the distance on both sides. These hills are not steep, but the 4% grade has false summits, dipping, then stair-stepping up again, for what seems like a long 15 miles. At the summit is your RS 7. Cokes and delicious chunky chicken noodle soup await you. Please try to start out with a group of riders here. Get ready for an awesome long, pay-back downhill! Your last stop Rest Stop, #8, is just 11.6 miles from the Finish. You can make it in from here! You will know you are almost home, when off in the distance, your first welcome sign will be a blinking orange light about a mile out of town. Now you can smile, and start to hum that Chariots of Fire tune as you close in! From that orange light, you have another mile to your Finish. About 1/4 mile before the finish is a signal light, which I hope is green for all of you! Joshua Tree Double Century is in your history book!! 200 miles! Congratulations! YOU DID IT! !